[DANIEL WEBSTER]. Broadside announcing his upcoming arrival at Springfield, Massachusetts, April 7, . 1 p., 12 x 16½ in. “Daniel Webster / The Union Man, the Patriot, is to be with us To-morrow. In July 1850, President Millard Fillmore appointed Senator Daniel Webster of Massachusetts as Secretary of State for a second time. Webster’s support proved critical to the passage of the Compromise of 1850, which he hoped would resolve the slavery issue and preserve the national Union. 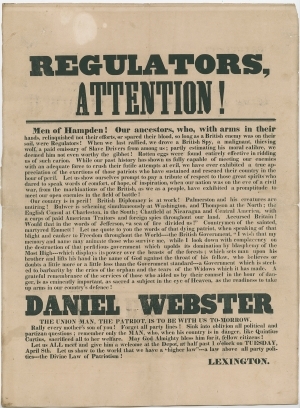 This broadside calls for Webster’s supporters to rally to welcome him home to Massachusetts. Although neither pro- nor anti-slavery, it praises Webster for his commitment to preserving the Union in the face of abolitionist complaints about the Fugitive Slave Law and perceived British meddling to encourage southerners to dissolve the Union. After Americans fought two wars against Great Britain, they displayed a recurrent fear of British interference in American politics, especially over the question of slavery. Many blamed the British both for supporting radical abolitionists with their “higher law” doctrines and for encouraging South Carolina independence to dissolve the Union. Various commentators attributed British motives for an American civil war to fear of the economic rivalry with the United States, opposition to America’s republican form of government, and a distraction from British intervention in Central America in violation of the Monroe Doctrine. The Anti-British text accuses British Foreign Secretary and future Prime Minister Lord Palmerston; British Ambassador to the United States Henry Bulwer; abolitionist George Thompson; George Matthews (an abolitionist and British consul in Charleston, South Carolina); and Frederick Chatfield, British consul-general to the Central American republics (Guatemala, Costa Rica, Honduras, El Salvador, and Nicaragua) of endangering the United States through their scheming. Though the Clayton-Bulwer Treaty of 1850 had recently assured America that any canal across the isthmus between North and South America would remain neutral and open to all nations, many differences remained. Some of the sentiments of this broadside also fit the ethos of the nativist American Party (Know-Nothings). While Webster had twice run unsuccessfully for the Presidency, perhaps the strangest circumstance came during the election of 1852, when, without Webster’s knowledge or permission, the Know-Nothings nominated him as their candidate for the presidency. He also received the nomination of the Union Party, formed by a group of Whigs in several southern states who opposed Whig candidate Winfield Scott. Webster died nine days before the election but still received 7,000 votes, mostly in Massachusetts and Georgia. The broadside’s final phrase is somewhat ironic. By a standard definition, patriotism favors one’s own homeland and government, rather than “Divine Law,” which is supposed to be universal. But the writer clearly takes issue with the abolitionist idea of Divine Law, which they place above even the Constitution. This author counters that by arguing that devotion to the Union is a “higher law” (different than the more abstract higher law of the crazy abolitionists). Providing a new take on the old idea of the Divine Right of Kings, this broadside’s “law of patriotism” is by extension divine, meaning higher than mere party politics. - Text of Webster’s speech at Springfield, April 8, 1851 from Weekly National Intelligencer (Washington, DC), April 12, 1851, p8/c5. Daniel Webster (1782-1852) was born in New Hampshire, graduated from Dartmouth College in 1801, and admitted to the bar in 1805. He represented New Hampshire in the U.S. House of Representatives from 1813 to 1817. As a preeminent attorney, he argued 223 cases before the U.S. Supreme Court, winning about half, and playing a key role in eight of the Court’s most important constitutional law cases decided between 1801 and 1824. (His arguments were accepted by Chief Justice John Marshall in Dartmouth College v. Woodward (1819), finding that a state’s grant of a business charter was a contract that the state could not impair; in McCulloch v. Maryland (1819), finding that a state could not tax a federal agency (specifically, a branch of the Bank of the United States), for the power to tax was a “power to destroy”; and in Gibbons v. Ogden (1824), finding that a state could not interfere with Congressional power to regulate interstate commerce). Webster represented Massachusetts in the House of Representatives from 1823 to 1827 and then in the Senate from 1827 to 1841 and again from 1845 to 1850. His 1830 reply to South Carolina’s Robert Y. Hayne is considered one of the greatest speeches ever delivered in the Senate. Webster’s oratorical abilities made him a powerful Whig leader, and he served as Secretary of State, first from 1841 to 1843 under Presidents William Henry Harrison and John Tyler, and again from 1850 to 1852 under President Millard Fillmore. His support of the Compromise of 1850 may have postponed a civil war, but it cost him politically in his increasingly abolitionist home state of Massachusetts. At the time, the case of Thomas Sims (1834-1902) rocked Boston. Sims had escaped from slavery in Georgia at age 17. Captured under the Fugitive Slave Act, on April 4, 1851, Sims was tried and sentenced to be returned to slavery. After efforts to rescue him failed, he was escorted by U.S. marines to a warship, where he was sent back to Georgia and sold to an owner in Mississippi. He escaped again in 1863 and returned to Boston. In 1796, Jefferson wrote to John Adams, “I am sure, from the honesty of your heart, you join me in detestation of the corruption of the English government, and that no man on earth is more incapable than yourself of seeing that copied among us, willingly. I have been among those who have feared the design to introduce it here, and it has been a strong reason with me for wishing there was an ocean of fire between that island and us.” Thomas Jefferson to John Adams, February 28, 1796. In 1797, Jefferson wrote to Elbridge Gerry, “Much as I abhor war, and view it as the greatest scourge of mankind, and anxiously as I wish to keep out of the broils of Europe, I would yet go with my brethren into these rather than separate from them. But I hope we may still keep clear of them, notwithstanding our present thraldom, and that time may be given us to reflect on the awful crisis we have passed through, and to find some means of shielding ourselves in future from foreign influence, commercial, political, or in whatever other form it may be attempted. I can scarcely withold myself from joining in the wish of Silas Deane that there were an ocean of fire between us and the old world.” Thomas Jefferson to Elbridge Gerry, May 13, 1797. Silas Deane (1738-1789) was an American merchant, delegate to the Continental Congress, and first U.S. diplomat to France, from 1776 to 1778. Robert Emmet (1778-1803) was an Irish Republican patriot who led a rebellion against British rule in 1803. He was executed for high treason, and this quotation comes from his “Speech from the Dock” before his sentencing. Springfield Republican (MA), February 17, 1851, 2:2; Mason Arnold Green, Springfield, 1636-1886: History of Town and City (Springfield, MA: C. A. Nichols & Co., 1888), 462. Springfield Republican, April 9, 1851, 2:1. Newspapers around the country reprinted Webster’s brief speech from the Springfield Republican. See The New York Herald, April 12, 1851, 3:5; The Daily Republic (Washington, DC), April 12, 1851, 2:2; Weekly National Intelligencer (Washington, DC), April 12, 1851, 8:5; Louisville Daily Courier (KY), April 16, 1851, 2:2; The Vergennes Vermonter, April 16, 1851, 2:3; Natchez Courier (MS), April 25, 1851, 1:6; The Sun (Baltimore, MD), April 12, 1851, 1:4; and among others. Springfield Republican, April 9, 1851, 2:4; The New York Herald, April 9, 1851, 2:4.